Osler has something for everyone. Here's just some of the great modules you can currently access on Osler. 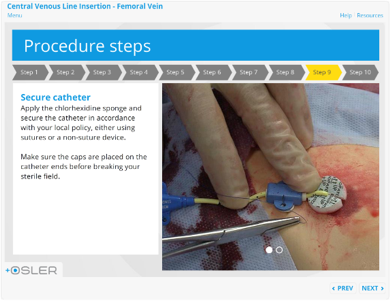 This module will demonstrate the techniques required to prepare for a sterile procedure, such as the insertion of a central venous catheter or a lumbar puncture. It covers handwashing technique, and a closed method for donning a sterile gown and gloves. This module provides the required knowledge to prime an IV line for the first time under supervision. In this module you’ll learn about how to prime and label an IV line, how to reduce risk of errors, and what information is required for documentation. This module provides the fundamental knowledge required to administer a medication via subcutaneous injection. 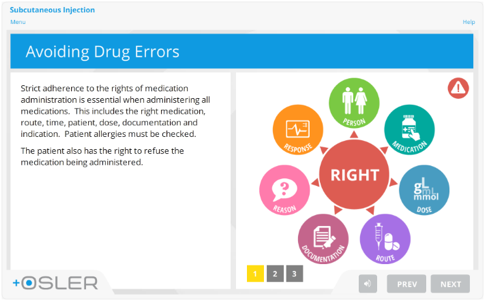 In this module you’ll cover preparation of the drug, drug safety principles and the technique for administration. This module provides the fundamental knowledge required to perform an intramuscular injection for the first time under supervision. You’ll cover recommended IM landmarks, how to reduce the risk of drug errors, and how to safely prepare and administer an IM injection. This module provides the fundamental knowledge required to collect a venous blood sample using a closed system. In this module you’ll learn about selection of the site and vein, equipment preparation, patient education, positioning and analgesia, the steps in collecting the blood sample, and how to conduct a post-procedural assessment of the patient. This module provides the fundamental knowledge to undertake a radial arterial puncture to obtain an arterial blood gas (ABG) sample. In this module you’ll cover the indications and complications of a radial ABG sample, the procedural steps, and the documentation requirements. 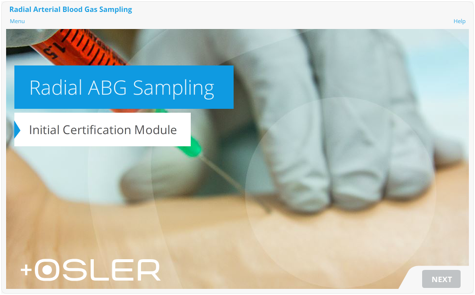 For information on how to interpret and analyse ABG results, refer to the Osler module Introduction to Arterial Blood Gas Analysis. This module provides the knowledge required to perform a peak flow and interpret the results. You’ll cover what a peak flow assessment measures, the significance of the result, how to instruct a patient in the correct use, and recording of peak flow measurements. In this module you’ll learn about the indications and contraindications of blood culture sampling, equipment required, and the procedure for obtaining a venipuncture sample, using a closed system approach. This module provides the fundamental knowledge required to insert an IVC under supervision for the first time. You’ll cover the indications for insertion, equipment required, how to prepare yourself and the patient, the procedure for inserting an IVC, and management of an IVC after insertion. This module provides the fundamental knowledge required to repair a wound with basic suturing. 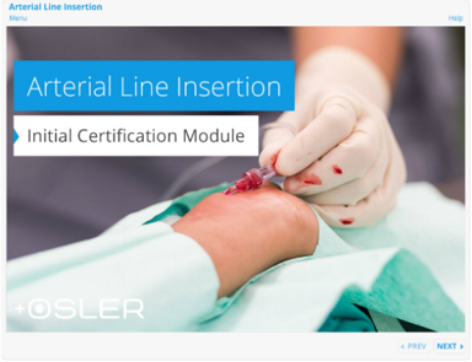 In this module you’ll cover wound types and indications for suturing, skin anatomy, the four principles of suturing, suture placement and knot technique, and complications of suturing. You’ll see videos of the suture technique and learn about how to protect the wound post-procedure. This module provides the fundamental knowledge required to insert an IDC in either a male or female. You’ll cover the indications, selection of an appropriate size and type of catheter, equipment and patient preparation, and the procedural steps. This module provides the fundamental knowledge required to insert a nasogastric tube under supervision for the first time. You’ll cover the indications for insertion, equipment required, how to prepare yourself and the patient, the procedure for inserting an NGT, assessment of placement, and nursing management of a NGT. Adult resuscitation steps should be followed according to the BLS algorithm. In this module you’ll cover the indications for initiating BLS, a detailed overview of the BLS algorithm within an acute care setting, and an overview of the Chain of Survival. Effective and early implementation of the four inter-related steps that make up the Chain of Survival will improve survival rates post cardiac arrest. 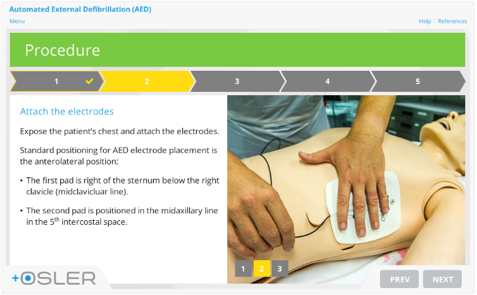 This module looks at the first 2 steps of the ‘chain’, early recognition and early CPR. 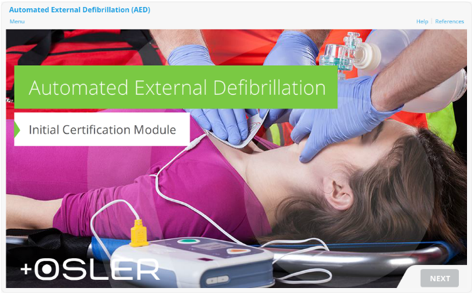 This module provides the fundamental knowledge required to manually defibrillate a patient in a cardiac arrest situation. 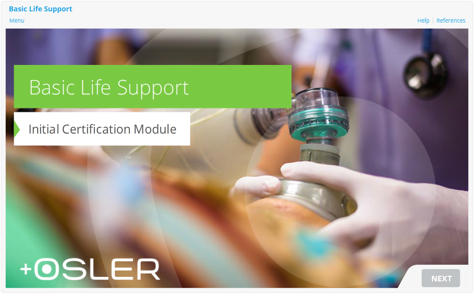 This module covers the equipment required, preparation of yourself and the patient, including correct positioning of pads, and the steps to conduct the defibrillation safely. This module covers techniques and adjuncts used to provide basic airway management in the unconscious patient. Improved patient outcomes from early defibrillation for ventricular fibrillation or pulseless ventricular tachycardia is well recognised. This module looks at the theory underpinning early defibrillation, and the procedure for turning on and following the AED verbal prompts. These online simulated resuscitation scenarios are designed to further develop your understanding life support theory. Each module presents realistic, real-time scenarios for you to manage, along with feedback tailored to your performance. 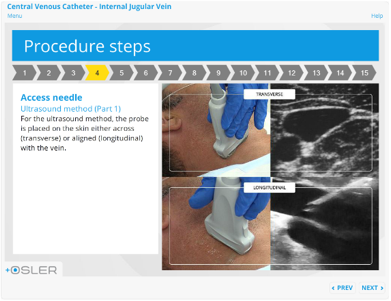 This module will provide knowledge fundamental to the process of inserting a vascular device under ultrasound. This module includes theoretical information about ultrasound, a basic understanding of correctly configuring your ultrasound machine, and the techniques used. 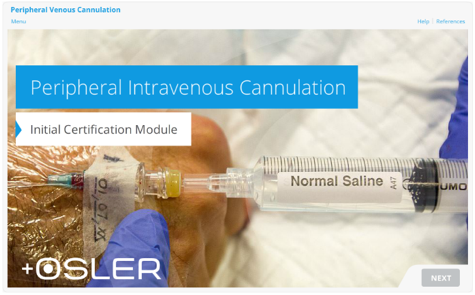 This module provides the fundamental knowledge required to perform the insertion of PICC line under supervision for the first time. You'll cover the indications, anatomy of the Basilic Vein and the procedure technique, as well as some of the common complications. 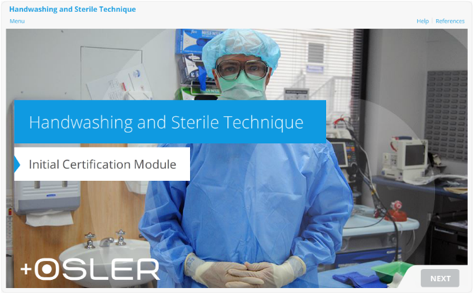 This module provides the fundamental knowledge required to use the Seldinger technique to insert a catheter or device.